Would he still make this sacrifice if he knew he wasn’t protecting our “freedom”? The child this young man holds in his arms, by my guess is probably only a few weeks old. The tears he’s hiding behind his hands are very, very real. The pain he must feel in his heart, in every fiber of his being, unimaginable. 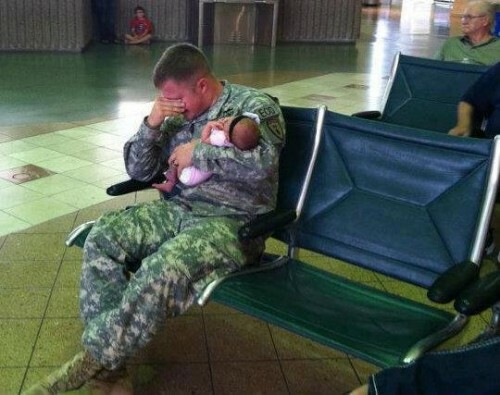 The caption reads: "This Dad is about to be deployed and is having to say goodbye to his newborn baby girl. Sacrifices like this are made every day, and may we be reminded, that our FREEDOM comes with a cost, and our soldiers and their families are paying it." As is all effective pro-war propaganda, this image is indeed a stirring one, putting the spotlight on those he leaves behind, portraying his noble sacrifice for the greater good rather than the deception that puts this young man in harms way and daily threatens any chance of ever seeing his baby again. Would he still make this sacrifice if he knew he wasn’t protecting our “freedom”? That he wasn’t “making the world safer” for that precious baby girl of his? That he is merely a pawn in some rich man’s wars? The only reason he’s leaving this little girl is because he’s been lied to. And if we owe them anything it’s not gratitude or respect, not worshi ppingthe lies they’re fighting and dying for, but rather to inform and remind of these deceptions in hopes that some, even one of them will do the right thing, instead.